Güveç or đuveč (Turkish: güveç, Bulgarian: гювеч, [ɟuˈvɛtʃ], Bosnian: đuveč, [ˈd͡ʑuʋɛt͡ʃ], Macedonian: ѓувеч, [ˈɟuvɛtʃ], Serbian: ђувеч, [ˈd͡ʑuʋɛt͡ʃ]) is a Turkish, Romanian and Balkan oven-baked meat and vegetable stew similar to ratatouille. 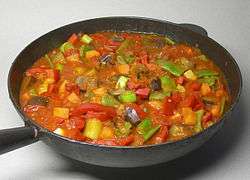 It is made with meat, olives, tomatoes, mushrooms, onions, herbs, and spices and is often served with "Balkan mixed salad", a combination of roasted eggplant, sweet peppers, garlic, tomatoes, and vinegar. The name đuveč, an earthernware casserole in which đuveč is traditionally prepared, comes from the Turkish güveç "earthernware pot". ↑ "Serbian casserole (đuveč)". The Serbian Cookbook. Retrieved 17 December 2015.